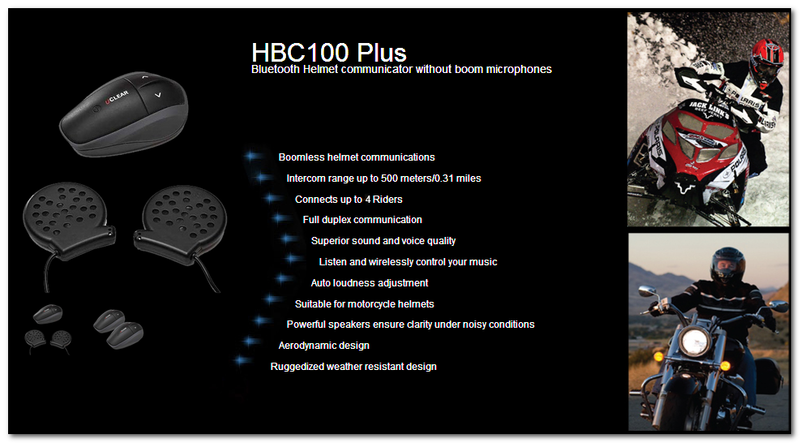 The HBC100 PLUS offers ABF, boomless microphone technology for communication with another rider up to 500 meters away. Like UCLEAR’s HBC100 and HBC200, the PLUS puts boomless, hands free technology into helmets. Riders can make a call, intercom with a passenger or nearby biker and still turn up the tunes. Connect up to two users and take advantage of improved HBC200 series design and upgradable firmware. Unique speaker design delivers HiFi grade music entertainment like your home audio equipment. Riding a bicycle has never been more enjoyable. UCLEAR HBC100 Plus is designed to be splash, rain, dust and snow resistant. It continues to perform in different environments. The HBC100 Plus Powersports Communications System includes all the great features of the HBC100, plus advanced features for extended range and enhanced voice clarity. Connect in many ways. Latest Bluetooth technology allows you to make and take cell phone calls, connect directly with another rider, and listen to your favorite music. Ride in any weather. Water and temperature resistant. Operating temperature of -29ºC (-20ºF) to 60ºC (140ºF) ensures reliable operation even in extreme weather. Keep your hands on the handlebars. Voice-activated pick-up allows hands-free operation of incoming phone calls. Get going. The HBC100 Plus installs in most helmets quickly and easily within minutes.